Fuzz pedal med N.O.S. Germanium transistorer. Pedalen har volum, gain, bass og treble-kontroller. What if you combine the ruthless sustain of a silver box Big Muff with the harmonic signature of a Tone Bender MkII and the unrivaled touch dynamics of a germanium Fuzz Face? Would you get the ultimate vintage Fuzz pedal? Here at Supro USA, we think so. The Supro Fuzz takes this “best-of-all-worlds” approach to old-school fuzz using an N.O.S. Germanium transistor in the first stage, followed by secondary, silicon-based gain and a dash of our special sauce to create a low-noise, high-gain fuzz box that will leave you deaf and breathless. Whether you’re looking for a touch-sensitive, vintage 60’s flavor or a full-on wall of modern sonic destruction, the Supro Fuzz delivers the goods while keeping your noise floor amazingly low. 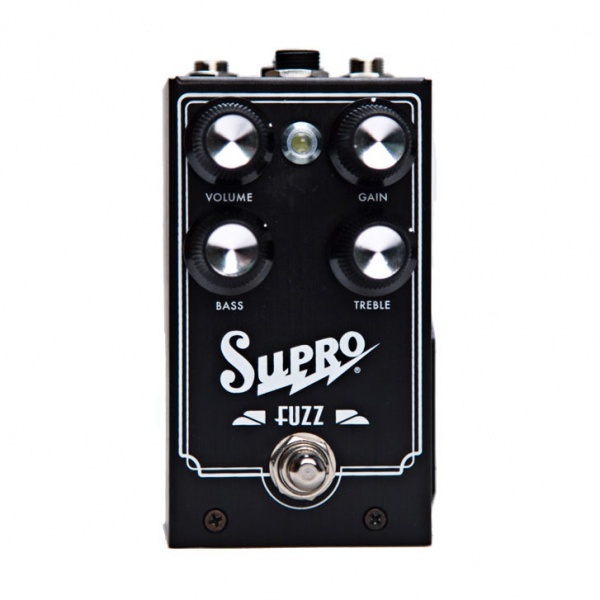 The Supro Fuzz pedal sports a simple control layout with Volume, Gain, Treble and Bass knobs. The independent EQ found on this pedal is drawn from the award-winning tone stack found in our flagship tube amplifiers, offering a huge range of adjustability without the frustrating limitations of a more traditional, one-knob EQ design. Both Bass and Treble controls are capable of cutting or boosting within their respective frequency bands, with each control designed to deliver the widest possible range of usable tones while remaining musical at all settings. Taking the fuzz pedal one step further, the Supro Fuzz offers a TRS port for expression pedal control of the TREBLE knob. With the expression pedal in use, the on-board TREBLE knob sets the maximum value, allowing the musician to accentuate or tame the abundant high frequency content of the fuzz sound. All Supro pedals are assembled in Port Jefferson, NY, USA, featuring custom-tooled, anodized, brushed-aluminum enclosures, 9V battery or AC powered operation, rear-mounted metal jacks, easy-access side-mounted battery drawer and studio-friendly, noiseless (click-free) true-bypass switching.